I don't have the luxury of taking reality for granted. And I wouldn't say I hated people who did, because that's just about everyone. I didn't hate them. They didn't live in my world. But that never stopped me from wishing I lived in theirs. "Why do you hate him so much?" I asked Tucker. "I don't know f "hate" is the right word," he replied. "Am afraid of him", "wish he'd stop staring", and "think he's a lunatic" are more accurate. Einstein's definition of insanity is doing the same thing over and over again and expecting different results. I kept taking pictures, hoping I'd look at one and know its subject was a delusion. I did my perimeter checks, thinking I'd eventually be able to walk around paranoia-free. I spent every day hoping someone would tell me I smelled like lemons. If I wasn't insane by anyone else's definition, I figured I was at least insane by Einstein's. In a weird way, it felt like he belonged here. He belonged in the land of phoenixes and witches, the place where things were too fantastic to be real. People say teenagers thing they're immortal, and I agree with that. But I think there's a difference between thinking you're immortal and knowing you can survive. Thinking you're immortal leads to arrogance, thinking you deserve the best. Surviving means having the worst thrown at you and being able to continue on despite that. It means striving for what you want most, even when it seems out of our reach, even when everything is working against you. 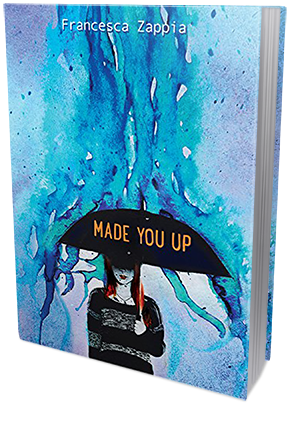 Made You Up is a heartfelt and quite deeply affecting YA contemporary novel dealing with mental illness, relationships, grief, family drama, crime and one's perception of reality. Featuring an eclectic cast of truly interesting characters with a fascinating unreliable narrator in the lead, Francesca Zappia's highly original debut is just as harrowing as it is entertaining, and just as realistic as it is bizarre and surreal. Alex is a schizophreniac. She suffers from frequent delusions, panic attack and paranoia. She keeps a Super 8 ball handy at all times to ask questions and takes photographs of anything even remotely suspicious to check if everything she sees is real. When Alex was a small girl, she hallucinated freeing a tankful of lobsters with the help of a blue eyed boy. It wasn't real, it never happened, it was only a delusion. Or so she thought, until, years later, she met the blue eyed boy again. And he changed her life. I realize not everyone will find this book to their taste. Parts of it are quirky, parts are very dark and sad, and its refreshing honesty isn't always sensitive and easy to digest. This book really is different from the majority of mainstream YA fiction, and while some will like this particular flavor of different, some will inevitably shy away from it. Personally, I found it endearing and intriguing. I wouldn't go as far as to say that I inhaled this book and couldn't put it down, but I did feel an emotional connection with the characters and I did care about them. I liked its edginess and I enjoying trying to figure out which parts of Alex's life are real and which are nothing more but a delusion. Yes, the story got confusing at times, but, in my opinion, that was part of its charm. I loved Zappia's writing style. Straight-forward and yet filled with resonating thoughts and confessions, it grabbed the entirety of my attention and allowed me to really get lost in the story. Alex is confused, lost and desperately trying to be normal; to live a normal life. She tries very hard. She takes pictures of things and people that she suspects might not be real, she struggles to keep her paranoia under control, she tries to make friends. And she is very brave and surprisingly positive. Frankly, I can't imagine what living with schizophrenia would be like, but I'm sure it's terrifying and incredibly nerve-wrecking, not to mention emotionally, mentally and physically exhausting. Pretty damn freaking scary, if you ask me. But, you know what? Zappia's portrayal of Alex's illness felt very real. She didn't over-dramatize anything, or use cliches and cheap tricks to play on reader's emotions, she simply allowed us a peak into Alex's mind, see the world through her eyes and draw our own conclusions. I really appreciated that. Richter, the blue eyed boy from Alex past, was just as fascinating a character as she was. Their relationship was weird and awkward and so totally unlike your typical YA romance, but it was also completely normal and kind of perfect. They had amazing chemistry. They didn't get along from the get go, they were both rather challenged when it came to friendships or other mundane relationships, so they really didn't know how to act around each other. Watching them grow into each other and start caring about one another (and then struggle to admit that, too! ), was heart-warming and delightful. I cheered for them. They made me laugh, even swoon, and I thought they were made for each other. Truly. Overall, Made You Up was a great book. I enjoyed it immensely and would recommend it to open-minded, sensitive readers who enjoy unreliable narrators and bitter-sweet, slightly dramatic teenage stories.